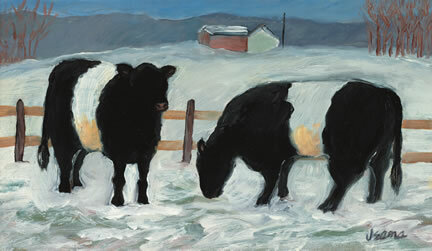 The essence of tranquility is portrayed in this view of a local Belted Galloway herd. Jean experiments with many media, but most of her work is in oil or watercolor. A New Jersey native, former teacher, super parent, grandparent, community volunteer, Jean steals time to experiment with all kinds of medium in an attempt to free her creative soul.